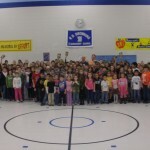 “The Secret Zoo” Author spent day with Browning students on March 18th! In celebration of “March is Reading Month,” the PTA invited Author Bryan Chick to discuss his story with students. We were delighted he spent the day at Browning on March 18! Bryan shared his experience of writing The Secret Zoo as well as his latest release Secrets & Shadows. Interestingly, the idea of The Secret Zoo came to Bryan when he was just nine years old! He wondered what it would be like if zoo exhibits had secret passages that allowed kids to get in and animals to get out. For more information, click on www.thesecretzoo.com. The success of an author visit is largely dependent on the students’ familiarity with the author’s work. To assist with this, Bryan’s publisher (Harper Collins) graciously donated several copies of The Secret Zoo to the school media center. If you haven’t already read his books, cuddle up and enjoy these wonderful stories together! To order personalized/autographed copy of The Secret Zoo &/or Secrets & Shadows, please return this completed form & payment no later than Thursday, April 1st.